If you have any questions about the LADY KATHRYN IV information page below please contact us. Coming from the Westport Shipyard ship building company in the United States the LADY KATHRYN IV is 50 metre 164 (foot) in length. Finished and launched in the year of 2008 this boat’s interior design showcases the progressive thinking of the design work of Donald Starkey Designs. The former names or project names were 5005. She can reach a high speed of 24 knots. An on deck full beam master suite creates a luxury private retreat for the yacht owner and incorporates the finest fabrics, cabinetry, stone and leathers. Also, a top deck VIP suite comes with its own sun deck and there is a large formal dining room adjacent to the ship’s galley. Her salon opens up to a large covered aft deck Yacht LADY KATHRYN IV was created when Westport’s design and engineering team collaborated with yacht designer Donald Starkey as well as naval architect William Garden. Together they developed a refined yacht hull ship for advantageous blue water performance. She also has an innovative accommodation plan in a six stateroom layout. William Garden was the naval architect firm involved in the technical vessel plans for LADY KATHRYN IV. Also the company William Garden and Westport expertly collaborated on this venture. Interior designer Donald Starkey Designs was charged with the overall internal ambience. In 2008 she was formally launched to accolade in Port Angeles Wa and post sea trials and final completion was afterwards handed over to the yacht owner. Westport Shipyard completed their new build motor yacht in the United States. The core hull was built out of composite. The motor yacht superstructure is made extensively with composite. With a beam of 9.17 metres or 30.09 ft LADY KATHRYN IV has spacious room. She has a fairly shallow draught of 2.23m (7.32ft). The 16V 4000 M90 DDC engine powering the yacht is built by MTU. Connected to her MTU engine(s) are twin screw propellers. The engine of the yacht generates 3650 horse power (or 1678 kilowatts). She is equiped with 2 engines. The combined power for the yacht is thus 4560 HP / 3356 KW. Offering cabins for a limit of 16 welcome guests spending the night, the LADY KATHRYN IV accommodates everyone luxuriously. Around Sept 2009 LADY KATHRYN IV cruised to Tarifa, in Spain. This motor yacht has traveled the cruising ground around Provincia de Cádiz during October 2009. LADY KATHRYN IV features a teak deck. 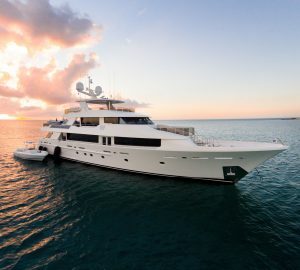 The luxury yacht LADY KATHRYN IV displayed on this page is merely informational and she is not necessarily available for yacht charter or for sale, nor is she represented or marketed in anyway by CharterWorld. This web page and the superyacht information contained herein is not contractual. All yacht specifications and informations are displayed in good faith but CharterWorld does not warrant or assume any legal liability or responsibility for the current accuracy, completeness, validity, or usefulness of any superyacht information and/or images displayed. All boat information is subject to change without prior notice and may not be current.